2009 was a great year from fans of The Beatles. Their entire catalog was digitally re-maste red, they are now a Rock Band video game, former Beatle Paul McCartney released a big ol' honkin' live set and a compilation disc from fellow former bandmate, George Harrison was released. Let It Roll: Songs by George Harrison was released back in June, the 16th to be exact. This is the first collection that covers Harrison's entire solo career. I have a love/hate relationship with best of's, greatest hits, retrospectives, collections or whatever you want to call them. They're great when you're being introduced to an artist or you don't feel like pulling out your whole collection. But, inevitably, there's always something I feel should have been included or left off but, wasn't. Everyone feels that way about these types of productions. There are some glaring omissions on this Harrison compilation but, those omissions have made appearances on some of his other compilations. It still would have been nice to see "Crackerbox Palace," "I Dig Love" and "Cloud Nine" on the collection as well as some of his work with The Traveling Wilburys. But, in all fairness, The Traveling Wilburys records weren't solo efforts. I know, someone will point out that songs he recorded with The Beatles are on here but they're not those versions. The versions that appear on this album come from Harrison's Concert For Bangladesh record thus, a part of his solo career. 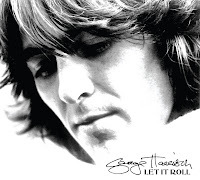 What we get with Let It Roll: Songs by George Harrison is a very nice look into Harrison's solo career. So many people tend to focus on the Lennon/McCartney songwriting machine that Harrison's songwriting is often overlooked and not as lauded as the solo efforts of Lennon and McCartney. The quiet one wrote his own fair share of classic songs and from beginning to end, you're reminded of that with this record. How do you review a compilation? Heck, I don't know! Well, lets see, it has a good selection of songs. It covers most of the bases with the casual fan, fan friendly, well known songs. It has some not as well known songs to make the more serious fans happy. I haven't given it a spin on a big fancy stereo system but it sounds great on my media player of choice. There's nothing new or radical here, just 19 songs of good ol' George. If you haven't updated your Harrison collection from vinyl or cassette or for some odd reason need to be introduced to the solo music of George Harrison, this is a good overall place to start.